Tesla Motors' Model S features a new design that allows the driver to swap out a depleted battery for a fully charged replacement in less time than it takes to fill a traditional gas tank. Elon Musk recently demonstrated the process on stage, and says that the only choice the driver of a Model S will have to make is if they prefer faster, or free. Recharge stations, which Musk refers to as 'Tesla Stations,' will offer two options to drivers needing to recharge their battery. Option one is to use the rapid charging station to plug in the car and wait while the battery recharges. The recharge is free, and Musk promises that it always will be. Option two, the driver pulls up to the charging station, and, guided by some low-profile rails on the ground, enters a battery swap lane. The mechanism automatically unfastens and removes the battery currently in the car, and then proceeds to install a new one. What makes this whole thing really impressive, is that the entire process of swapping batteries takes only 90 seconds to complete, and the driver never even has to get out of the car. 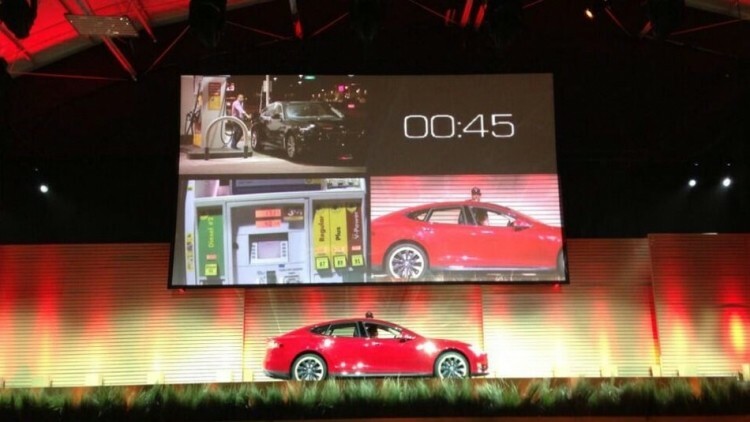 In the video below, Tesla sent a guy to a regular gas station to fill up his Audi, and during that time, they were able to swap batteries in two Model S’s on stage. While Tesla owners may indeed have a choice between free and fast, there is yet no word on how much ‘fast’ is going to cost. The battery swapping stations, which cost $500,000, work with all Tesla Model S cars, including older models, and will be coming to the busiest transit areas first, reports Mashable.